So I went to the shop, there were three guys behind the counter. I said, "What's the worst wine you have?". They all said, "NIGHT TRAIN!". So I got some. Seems it's still being made. And, I just found a bottle behind our bar. I imagine our Night Train is a few decades old. I have learned so much from this forum, using the hints here. I just searched the Web for more info on this Night Train, found a site comparing Night Train, Thunderbird, and Cisco. I only heard of Thunderbird before this thread, now I learned of two more. Here are the connoisseurs' notes on these awe-inspiring fortified wines. "The Night Train runs only one route: sober to stupid with no round trip tickets available, and a strong likelihood of a train wreck along the way." "Often, people on a Cisco binge end up curled into a fetal ball, shuddering and muttering paranoid rants... The FTC forced them to drop their marketing slogan, "Takes You by Surprise," even though it was entirely accurate"
"If you like to smell your hand after pumping gas, look no further than Thunderbird. As you drink on, the bird soars higher while you sink lower... WARNING: This light yellow liquid turns your lips and mouth black! A mysterious chemical reaction makes you look like you've been chewing on hearty clumps of charcoal." My oh my! How to choose? You don't. A well-stocked bar must have all three. Boy. That Night Train will let you meet your maker. When I moved from CT to CA years ago (1982), a close friend in CT gave me a bottle of NT as a joke. We passed it back and forth thru the mail for several years as a joke Xmas gift. He came to CA on business many years later and we got together and opened it. You can start a new tradition with Ronco lighter fluid! We used to have Thunderbird, but some friends actually drank it (this was several decades ago). The Night Train we have is black-labeled. Nobody wants to drink it--but it does get passed around--and stays unopened. That was Walt Whitman-esque! "If you like to smell your hand...". Please post the link to whereever you found these pearls. The world could use another Onion. I need to snag some Night Train to serve the relatives during the holidays. We're always looking for a new wine to serve and since I don't drink wine, Night Train seems like an entertaining choice. Everybody should get some Train in case they want to kill someone. The prof is Romanian, his wife was from NY. They didn't deserve that. On the subject of cheap wine, I'll never forget one Thanksgiving at my Mom and stepdad's back in the late 90's, they had Boone's Farm. I don't know if you'd call that stuff "wine", or "wine cooler", or what, but I just had to laugh, because it was the same $2.69 stuff that the under-age kids that worked with me at Papa John's were always begging me to buy for them. This thread is proof that while growing older is mandatory and strictly enforced, growing up is optional. I still remember an old quote from an interview with a Canadian winery rep......he said, regarding one 'product', that "This is a wine for people who don't drink wine". There's a derby for KY? Now *that's* awkward. Ya pick a bunch of Concord grapes, squish em a little. ferment 7 days in a beer crock, and then squeeze the juice out thru an old T shirt. heh heh heh - but then some might consider that a tad beyond fugal. Later when I got 'rich' I graduated to Gallo. Gallo. I recycled an over-great quantity of that onto a large white shag rug after a college spaghetti feed. Alcohol laced purple food coloring. Not a proud time. Did not get laid. Where's the mint julep recipe! I remember a guy I knew at college who would come up with inventive ways to contribute to my expenses when he'd catch a ride home with me (about 3.5 hours away). One time he produced a bottle of Mad Dog 20/20, the kiwi flavored one, to give me as thanks. Definitely not a good unit of trade! Ahh, brings back the youthful memories of jugs of mountain burgundy and popcorn that always seemed to be the fare during those graduate classes held evenings in the professors living room, with each graduate student trying to outdo the other in looking both sophisticated and witty. Eh, just because we are old does not mean we lose our humor. In fact, I get more relaxed as I get older. I used to be a very grouchy young man. Now, I just don't care about much anymore. Life's short. Gee! We give you the following assortment to choose from, and you still want stinkin' mint julep. Never had Boone's Farm, but in looking it up on the Web and seeing the picture, I recalled seeing it in a store somewhere. I thought it was some kind of Italian soda syrup, but apparently not. Here's what I found in a Web site. Drinking Boone's Farm is kind of like snorting glue, but in a bottle. Boone's Farm - which contains so little alcohol and even less reputation - makes Mad Dog 20/20 look like Dom Pérignon. And they warn that you will not get drunk with so little alcohol, but with the sugar overload, may fall into a diabetic coma. MD 20/20 got the following review from that site I found. You'll find this beverage as often in a bum's nest as in the rock quarry where the high school kids sneak off to drink... Some test subjects report a slight numbing agent in MD 20/20, similar to the banana paste that the dentist puts in your mouth before injecting it with novocain. Not I. Never went to any party when in school, as I spent all weekends working in a factory job. And none of my profs in graduate school ever held a party, or perhaps they never invited me. I missed out on all the "good stuff" in my youth, so perhaps that why I was a grumpy young man. PS. 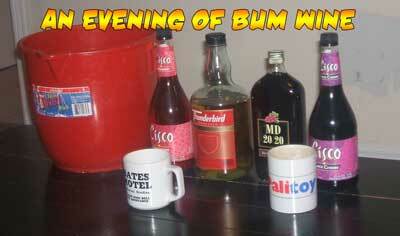 But I am not going to relive that youth with the bumwines, so don't worry about me. I still have several bottles of XO to savor. You can use simple syrup instead of the sugar and water. Some people crush the mint leaves, others just let them soak in the mix. Combine all ingredients and stir. That's it, very simple. Is your avatar a photo of you pouring it? I thought you were mixing up some fuel additives. That should have a spot in the ER Forum Cookbook ("sticky" thread in the Other Topics area). I'll post a Night Train recipe once I get up off the floor.